Continuous operation, with intermittent use. Electronic system is set to hold a minimum 121°C for 16 minutes (except 210006), 126°C for 11 minutes or 134°C for 3.5 minutes when loaded with instruments. On model 210006 the electronic system is set to hold 121 °C minimum, for 18 minutes when loaded with instruments. All sterilizing times incorporate a safety margin between 0.5 and 1 minute depending on the operating temperature. Nominal operating pressures are 1.05 Bar (15 psi) at 121°C, 1.6 BAR (23psi) at 126°C, and 2.2 BAR (32 psi) at 134°C. 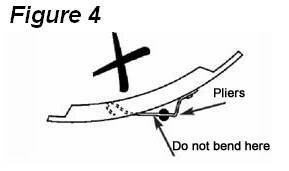 Minimum vessel burst pressure is 7.8 Bar (115 psi). To replace this valve, remove lock nut from inside the lid with a 13mm spanner and lift out complete valve (Fig.1). Replace the valve with new one. Ensure cutouts in the aluminium valve body fit into notches on top handle. To remove this indicator, locate M16 hexagonal nut in a socket and use the specified tool to undo the red cap. (For tool kit see 6: Tools and Test Equipment). The gasket offset device (GOD spring) is a very important safety device. It ensures that if the lid is incorrectly fitted pressure cannot build up.The spring is forced away from the gasket by the body lug as the lid is rotated. 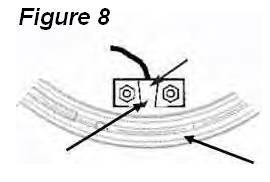 The spring allows the gasket to seal when the lid and body lugs are in a half lug engagement or better interlock position. To work correctly the spring must be firmly riveted to the lid. It must protrude on the inside of the lid, past the flange by a minimum of 1mm (with gasket removed). 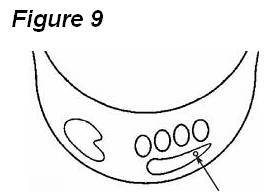 See figures 3 and 4. A new spring cannot be fitted without the correct factory equipment, spring and riveter. If the spring or rivet is damaged a new lid must be fitted. Ensure the lid is flat and stable and apply the pliers vertically. 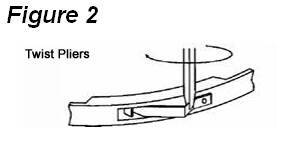 Locate the pliers onto the back edge of the spring and twist inwards carefully. Do not buckle the spring. Check visually and measure the distance again. 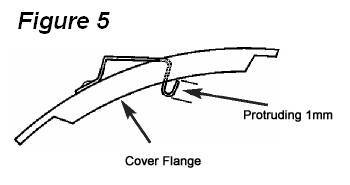 Remove the lid and gasket to ensure that the spring is protruding from the edge of the flange by 1 mm. (Fig. 5.). Side handles are held in place by M5 securing screws. 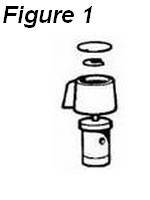 To remove the top handle, first remove the steam release valve as previously described, (Fig 1.) Unscrew the side handles. Once the top handle is removed the steam duct can be removed by releasing the two retaining pins. After removal the steam duct will need to be replaced with a new one. 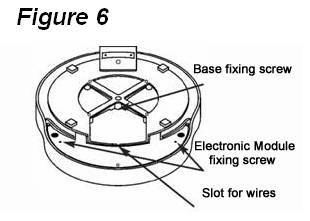 Insert the two pins into the appropriate holes in the lid and secure in place by melting the ends using the tip of a hot soldering iron, ensuring that the pins cannot pass back through the holes. 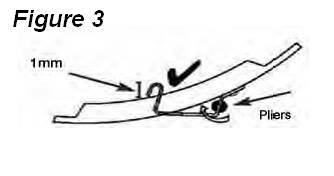 Replace new side handles and top handle following the reverse of the sequence previously described. New seals must always be used when refitting the top handle, steam duct and steam valve. To remove, first take off steam release valve and top handle as previously described (on the 210134 and 210006 you need to remove the steam duct as well). Break off retaining clip and throw away old assembly. (Never re-use assemblies). 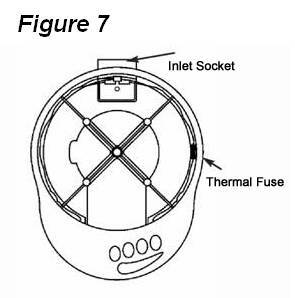 Fit new air bleed device with âOâ ring, push into lid hole, place washer over valve stem and force âpush fixâ down to lock the device in position. Use special tool to push clip over air bleed device spigot. (For tool kit see 6: Tools and Test Equipment). Simply extract the old gasket from the lid flanges and replace with a new one. Only genuine Prestige Medical parts to be fitted. Note: No lubrication is required for the gasket. However, if the lid is difficult to put on, Vaseline (petroleum jelly) can be lightly smeared around the edge and underside of the body flanges. Lift out heatsink to remove module from base moulding. Disconnect the display ribbon cable connector. Next, remove the earth wires from the body stud, then loosen the nut for the thermistor wire clamp (All M5 size). Disconnect the push on terminals from the wiring of the base and the heater element. The electronic module is now free (Do not remove the thermistor fixing nuts). Next, remove the fixing screw M5, in the centre of the base moulding and pull off the base moulding complete whilst feeding the module between the moulded support legs. The thermal fuse is in the base moulding, to gain access to this part, remove the base as previously described. If the autoclave is in an ambient temperature of 0°C or less, it will not start a heating cycle. In the event of this occurring, warm up autoclave by moving to another room or add hot water. (Donât forget to empty and refill with de-onised / distilled water).